Hi, I am interested in your 1966 Ford Mustang (stock #5000-CHA) listed on Autotrader for $24,995. I'd like to get more information about this vehicle and confirm its availability. While on the surface this just looks like a clean and classic 1966 Ford Mustang, under the hood is a rumbling motor that gives this pony extra gallop. So if you like to look good and sound, this is the coupe for you. The factory-correct Silver Blue Metallic was given a respray later in life, and the result Is extra vibrancy from a modern clearcoat finish. This nice luster also helps highlight the crisp lines of the classic Mustang sheetmetal. And while this one has a great vintage look right down to the shining chrome bumpers you also get the hint of extra aggression in the first impression. After all, you have completion-style American Racing Torq Thrust wheels, and the staggered tire sizes offer a bit of an intimidating stance. The black interior feels fresh from a recent investment. So its a nice place to spend some time, especially with other upgrades like the AM/FM/cassette stereo. But what will really grab you is how much this interior wants to get down to speedy business. Youll sit down in the bucket seat and grab the wood-rim steering wheel. Your right hand will be instantly attracted to the T-handle shifter, and the white-faced SunPro auxiliary readouts are a bold standout in all this darkness. This gets your senses ready for something special even before you twist the key and hear this roar. Under the hood is something quite special. The 289 cubic-inch motor sounds and feels to be built, thankfully, it was installed in this street machine instead. That means you have a sturdy V8 that was enhanced with performance upgrades like roller rockers, closed chamber heads, performance intake, and an Edelbrock four-barrel carburetor. An upgraded V8 also means you have a sweet rumble out of the dual exhaust. And the race-inspired four-speed manual transmission gives you full control over this performance motor and its growling soundtrack. Plus, traction bars and new tires complete a package designed to effectively get the power to the ground. 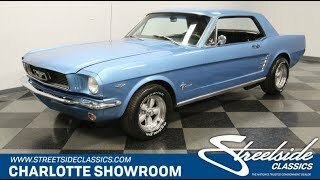 This is the pony car with extra power and extra poise, so at a price like this, you know you need to hurry if you want to take it home.